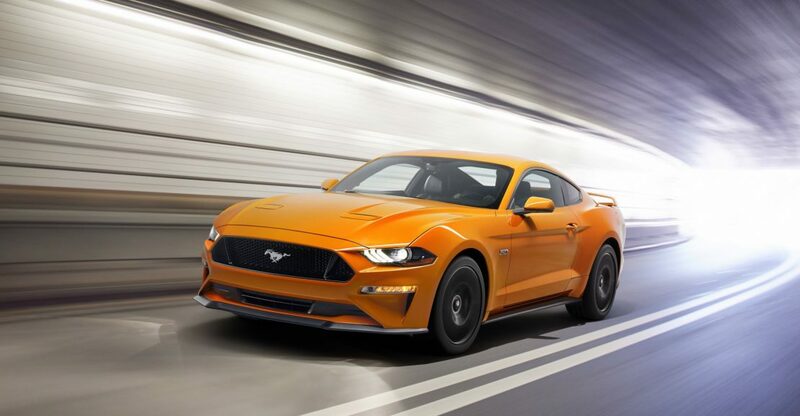 Legendary vehicle, The Ford Mustang updates itself by small changes while keeping its famous esthetic. The real innovation is located under hood: a new motor and driving assistances. The new Mustang keeps it genuine form but becomes more aggressive with the addition of a new radiator and bigger air entrances. These changes bring a brand new dynamism and modernity. At the background, few changes, only lights become red instead of translucent. Finally, the Mustang is more distinct. Ford will keep on offering its 2,3L 4 cylinders Ecoboost basic model for which the power has been decreased. The main change is about the Ecoboost option: more power at each acceleration. Then, a new sound package has been added in order to urgrade the engine noise. The V8 has a new injection system and switch between 421 and 450 CV. This new generation of Mustang is available with an option “automatic transmission” and new speed ratios: 10 against 6 before. Furthermore, the new gearbox provides more power. Now, acceleration capacities are really stronger than it has never been! Ford created and built the Mustang with plenty of technology innovations and driving assistances. Moreover, the dashboard is now completely digital and the driver may choose different ways of driving. Furthermore, the arrival of a central monitoring screen is in the plans!